So...you have decided to blog. You have set your purpose, you know your audience and you have begun getting your thoughts out. Now what? Again, I am no expert and just stumbled into this blogging thing, but here I will share ideas, as people have asked. I think the next step is to review all that you have written and find/define/refine your voice. Voice, in this instance, is how your readers will connect to you. From reading your words, what will they conclude about you? This is where you get to decide how you want to be portrayed. Just like we share with our students, our voice may be different depending on our purpose. So I suggest that you connect your purpose and your writing and find the common thread, your voice. In my blogs, I choose to just be me. No frills, no airs, no hiding behind big words...ME. I would hope that through my writing, you know my heart. Writing my Thesis Paper, that was all mind...now I am ready to show my heart. If you ever meet me, the hope would be, that you already know me. You would already know my purpose, my beliefs, my ideas, my quirky attempt at humor. When I write here, I KNOW there are so many mechanical errors, and I'm ok with that. This is not an academic piece of writing, these are my truest thoughts and feelings...and in it ellipses, run wild. This is very different than any writing I do for my job or when I was in Grad school, and I like it. What is the voice that you want to your readers to hear? There are so many to choose from: academic, philosophic, expert, ad visor, learner, are you vulnerable, are you matter of fact, disrupter, thinker, questioner, friend, foe, encourager, inpspirer? Once you decide, look at your writing through that lens. This is where I would suggest you do your first revision. Does this voice come across in your words, your style? Hone in on it, use laser focus as you revise in this step. Are you ready to publish? Again...that is up to you. There could be a few more steps, which may or may not be discussed in later posts. You will know when you are ready. Don't rush it, this is a process. You are going through the writing process, just like our students. On another note, I have been receiving some questions regarding blogging...thought I would share them with you. Again, I am no expert, I have taken 0 courses, these are just my free flowing ideas. Question: How do I know if my blog is too long? I know that my attention span is quite short, and if a blog is too long, I either skim or click out. That being said, I KNOW mine tend to be too long. Here is that "limbo". I have tried to cut mine down, after I have written, but then part of the message gets lost. So, this is my advice and what I always told my students when they asked "How long should my paragraph be?". It should be as long as you need to get your thoughts across. This is why I suggest that your first writing is always a "word vomit"....get all the ideas on the page. Then go back and see if it makes sense, are there things that can be taken out? Sometimes, there is SO much information, that it can be turned into multiple posts, such as these ones. Ultimately, it is your call. This is YOUR work and YOU decide. Question: How do I know when I'm ready to publish? The answer to this one is sticky. I always publish, too quick. I know if I don't hit that button, I will spin on it FOREVER and it will consume me. For me, I just need to publish after one quick reread. But here is the deal with me, after I publish, I literally edit or revise it 15-20 times. This just seems to work for me. It is all in your comfort level. If hitting that button is causing you anxiety, try a "pilot" post. Write a very short post about why you decided to blog. Maybe 1-2 paragraphs. Publish it and then walk away. Let it linger out in the Bloggesphere. Breathe. See what happens, any bites, comments, questions. Then reflect, assess and keep moving forward. Take that first step, it's usually the hardest. ​The previous post in this section: A Blogger...Not I (Blogging Part 1): focused on a few things to consider, when/if one decides to blog. Reflecting on that post, I think I need to take a few steps back and dig in a little more. I am going to take the very first idea in that last blog and expand on it. I think this is THE most important piece of this process. I would like to add something to this step, one needs to not only think about the purpose for your writing, but also the audience. When you know both of these things, it is easier to have a focus and flow, when you write. The audience I began blogging for, was an audience of one...ME. I had a lot of things that I needed to process and writing seemed to be a great place for me to work through them. I started writing, with no intention of it ever leaving my Drive...ever! I really don't know what actually caused me to publish my writing...no one would care what I had to say. And if it actually was read, I was being totally vulnerable...that could be bad. But for whatever reason...I created a blog site and I pushed "PUBLISH". Strangest thing happened...I started receiving messages along the lines of "Me, too!" or "This speaks to me". WHAT?? Hmmm...So I continued...about a blog a week. I had to get this stuff out, at first, selfishly...for ME. As I worked past things, my blogs have changed, but I realized that in the end, they all had the same purpose. A purpose other then me airing my issues... The purpose had moved to the hope of reaching ONE person, helping ONE person. I realized that the things I was dealing with, were not isolated and people felt connected, which for many, is cathartic. So that became my purpose. To reach and help others. I don't know if that is what is happening, but that is the intent. Now, as far as my new audience...I was shooting for educators, but not any specific type or group. I am writing from a place of "limbo" as my site title states: "Leading in Limbo". I sit perched upon a fence where I see two sides of the same world. So, I think my audience is "the every man/woman". As I changed, my topics changed. But what will NEVER change is my transparency and authenticity. Those two things are extremely important to me. Now as stated in the previous post, I have found that I have since found some other purposes for writing, so I created these "spin offs". One is were I will put interviews of #EDUrockstars that I have worked with, and then there this one, where I will try to share more practical information. Enough about me...What is YOUR purpose for writing a blog? I listed some possible ideas in the last post, but yours may not fit in there. Your purpose needs to come from within. Something that is tied to you, to your heart, your emotions, your mind. Once you find that...the blog topics and ideas will start flowing. At some point, consider your audience, just like we tell our students. You would write differently depending on your audience. Do you write from your brain or write from the heart...or both? Do you write a "how to" step by step or "a day in the life". Do you self reflect or pose questions? It all ties back to purpose and audience. *If you are struggling with this step...move on to this one: Write...Write...Write. Let the words flow out of those fingertips, no filter. Give yourself time. Once you have quite a bit of writing...reread...looking at it through only these two connected lenses: WHAT IS MY PURPOSE? WHO IS MY AUDIENCE? Hopefully, the dots will line up. If not. Take a break. Take a breath. Try again in a week or so...but don't give up, if this is something that you are feeling compelled to do. There is a reason. Write on!!! So yesterday, someone called me a blogger...this took me by surprise. I do write these blogs, but a blogger? I'm not too sure. What makes a blogger? Do you simply need to write in a blogging format? Do people have to read it? Do people have to comment? Does it need to be tweeted? Retweeted? I don't know the answer. 1) Start with a purpose. Why do you want to write? What do you want to write about? This is an important step, because this is what will drive everything else. If you are feeling you need to blog, because others are doing it, but are unsure of your purpose...you may not be ready...yet. It would be hard to sustain writing, if the purpose is unclear. Will you be writing to reflect on yourself, on your practice? Will you be blogging to showcase your ideas, your work? Would you be blogging to share your journey, your learning? Do you want to give readers an insight into your classroom, your site, your mind? Is it a combination? Whatever it is, once you have decided on your purpose, you are ready to roll. * Can you change or add to your purpose? Of course, we are always evolving. This blog page here, is a spin off of my original blog. I have added two such spin offs in the last 2 weeks as I feel I now have more than one purpose for this site. 2) Read other blogs that are similar to AND different than your purpose, your idea. Pay attention to platform, format, voice, flow, intent. Use these examples to begin to craft an idea in your mind...picture what your blog would look/sound like. 3) Find a platform that you are comfortable with. The common ones I have seen are Weebly, Wordpress, and Blogger. There are others, explore them all and find one that fits your needs. You might start using one and decide to use another. Take the time to play around as it will be difficult to change after you have some followers. 4) Think of a title. This should be something that reflects you and your purpose. Think of something catchy. This is your first introduction to your readers. Take some time to think of something that you are proud of, a title that you love. You can always change it, but once your blog has a following, this might be hard to do. 5) Write...write...write...write. Find what is comfortable for you. Writing in a journal? Typing in a doc? Writing directly into the blogging platform? Write bullet points, outline? Talk into a recording app such as Voxer, memos on your phone or voice typing in a Gdoc. Just get your ideas out. Again, this is personal to you. I find that this step, for me, changes depending on what I am writing about. For the purpose of blogging, I have gone from writing on a Gdoc, to writing directly into the platform. There are positives and negatives to both. If I am writing about something more personal, I tend to write with a pencil or pen in a journal. You will find what works best for you. What do you write about? For now...just "word vomit" onto the page. Don't edit, don't revise, just let it flow. Let the ideas go from the brain and/or heart onto the page, unfiltered. Often we start writing about one thing and it takes on a life of it's own and goes another way. So just set aside a quiet time and place to let the words flow. Is that it? Are you ready to post?? Some may be...but maybe not. What I have found, in writing these blogs, is that I actually go through ALL of the steps of Writers Workshop. I go through the complete writing process. So, this post has taken you through the Pre-writing phase. We will explore the Writing phase in future posts. Happy writing!! Last week, the wonderful Christine Pinto asked me if I would write a guest post for her blog. It has been a pleasure getting to know and collaborate with this #educrockstar. 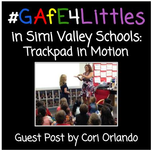 She has brought her energy and passion for littles to Simi Valley USD and the fire is growing. Here is where you will find practical tips, tricks and ideas. Hope you find some useful!